An excellent show! I've been there too. The concert was amazing! Some of the audience was strange, in this I agree with brinberlin. But it doesn't harms us a lot. The few people in our block, who clap hands in the middle of a song, because they thought it's the end.... who cares about. But the extraordinary situation, imho, was 'First we take Manhattan..' and the complete O2 finished '...than we take Berlin', was awesome. 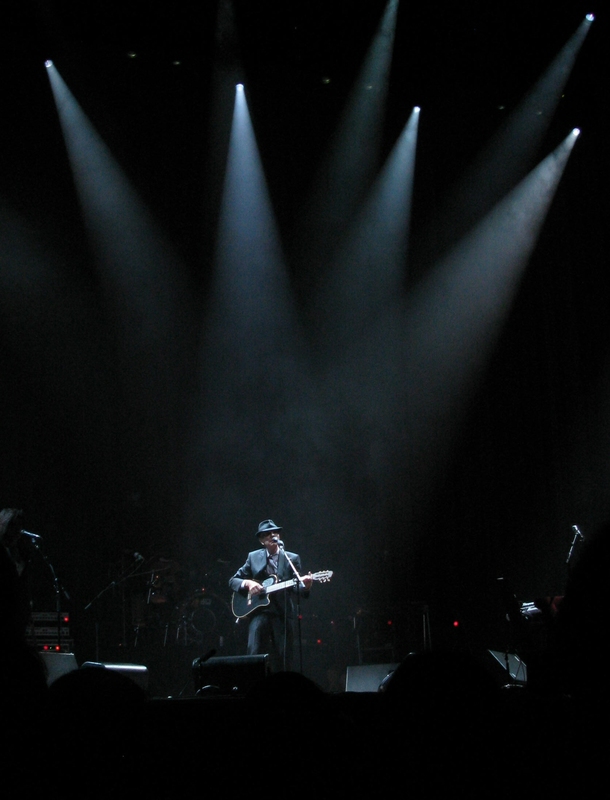 This are my impressions of the evening with Leonard Cohen. Last edited by AdinaCohen29 on Mon Jul 06, 2009 12:34 pm, edited 2 times in total. I am still overwhelmed with the memories of this concert. We were priviledged sitting at third row middle and thus be spared the getting up by members of the audience and hassle reported in other posts. I had to chose between taking anti pain meds against migraine and thus missing out on the concert or suffering the pain and seeing Leonard Cohen perform for one last time in Berlin. I am glad I decided for the later. This was a brilliant concert and I will carry this with me for a long time to come. I haven't seen them since late last year and my impression was that the mood has changed. Last year they seemed to radiate the sheer joy of being on stage together. This year a more melancholic aura was upon them, as if they were aware that this was a saying goodbye tour. Still or maybe because of that this was a most touching experience. The music was excellent and at times I had to hold my breath for the sheer beauty of it. Everyone in that band is a master of his/her own. And Leonard is outstanding anyway. There were smiles from the band to the audience and when saying goodbye Leonard looked at the audience as if taking in that picture for a last time, knowing he was not likely to return to Berlin. I had the impression he and the band appreciated the reception they received from the Berlin audience and at least the people around me and myself appreciated that night's performance. Leonard thanked the audience with a buddhistic bow at least twice. which deeply touched me. In my humble opinion no one but Mr Leonard Cohen deserves that bow so I humbly return it to him. All good things to you Leonard and to all your marvellous friends on stage. Last edited by Caren on Sat Jul 04, 2009 6:36 pm, edited 1 time in total. Melancholischer Entertainer, betender Poet: Leonard Cohen zaubert intime Stimmung in die Berliner O2-World. Hi Jarkko ,thanks for such a beautiful photo, ( Suzanne - my name but writen in german with s ! ). The light coming down on Leonard .... so beautiful !Thanks to you ...I`m counting days till Aug. 3th. in Venice ! Your photo is so POWERFUL, I was moved to tears. An overwhelming composition with the four spotlights, how a propos for our very own High Priest. (There is that significant number 4 again). I would like to take that shot to ... the pawn shop, I mean, the photo shop and see what they can do for me. Thank you, Jarkko for posting it. A very talented family. Last edited by bridger15 on Sun Jul 05, 2009 8:51 am, edited 1 time in total. An absolutely incredible photo. Thank you Jarkko and Eija. I love the band more than I ever thought I possibly could but for me, this photo says it all. This is how it began and this is how it will end. I absolutely second what you, Caren, wrote about the concert. Having attended the Hamburg concert last year I now experienced a completely different audience that received Cohen with much much enthusiasm than the people in Hamburg did. The enthusiasm he deserves. Yes, there were those people who started clapping before the song was ended and yes, there seemed to be a lot of people just waiting for Susanne and Bird on the wire and also those who were hysterically taking pictures. Sadly, you'll find them everywhere. Luckily, I had none of them sitting next to me. The band was great and IMHO the stiff and unsmiling attitude of Cohen's lady singers was part of their performance. Was just the same in Hamburg. The musicians were fabulous and so was Cohen. Smiling timidly, he seemed to be deeply touched by the way people were showing their love. Admittedly, I've been crying during his encores, being aware of the fact that this might be the last time I saw him. Also, because I had this dream since I was 13. Once in my life I wanted to see THIS MAN live. Well, I did and he will never know how much his music and poems meant to me. Leonard, I love you and I bow low to you. Grazie Paolo, thank you, very beautiful pics. I enjoyed them very much. this really is a once-in-a-lifetime photograph, so powerful that I will not ruin it by even trying to explain the effect it has for me! Thank you so much for sharing it! I think we need to be careful not to read too much into facial expressions and the like. These are very professional performers, and there will not ever be a back-stage row. Leonard will choose the pieces to be performed, no doubt in consultation with Roscoe, and the band will then follow his instructions. To suggest an off-stage argument is ridiculous. Leonard did not seem tired to me, but let us remember that this was one of those dates without a rest-day in between. Having been to six of his concerts in 2008, I was very pleased to hear Miracle (one of my favourites) for the first time. I was sitting in the fourth row on the extreme left (stage right) and was not troubled by people walking up and down with food. In fact, I thought the Berlin crowd was especially warm. They came up to the front at the start of the first encore and stayed there, even though there were many songs still to sing. The audience was particularly warm during Closing Time, when we were all swaying together. The only thing that I did find distracting was the number of flashes going off. Surely these people know that their puny flash isn't going to iluminate the stage, so they may as well switch it off? I got home to England on Saturday to find the Weybridge tickets waiting for me. Excellent!